Do you want to win some Chamilia Jewelry? Enter to win some great Chamilia Jewelry! I have joined forces with some great sites — that you can see listed in the photo above — to giveaway $235 worth of Chamilia Jewelry! As you can see in the picture, there are great things that you can get if you win, but you know what? You can’t win if you don’t enter! The giveaway runs from November 17th – November 23rd, 2013. There winner must be 18 years of age or older, and must live in the United States only, sorry. While the giveaway is going on, take a few minutes and visit the rest of the sponsors to see what great Disney content they have to share! Thanks, everyone, for stopping by, for taking a look at all of the great content we have to share with you, and most of all, for making our blogs and pages as special as they are because of your participation! Good luck, everyone! Four and a half days left in our Pixie Vacations Prize Pack Contest! I love this website tons of fun stuff to read and dream of disney!! I don’t own any Chamilia Jewelry and the more I see it, the more I think I need it!!! I have several Disney charms on my Chamilia bracelet. I love them!! Thank you so much for this blog. What started out as a giveaway entry has become an answered prayer. In my heart, I’ve won already with or without the jewelry. God has placed a calling on my heart. Thank you! These giveaways are great! I would love to give my daughter the Chamilia for Christmas. She would absolutely LOVE it! 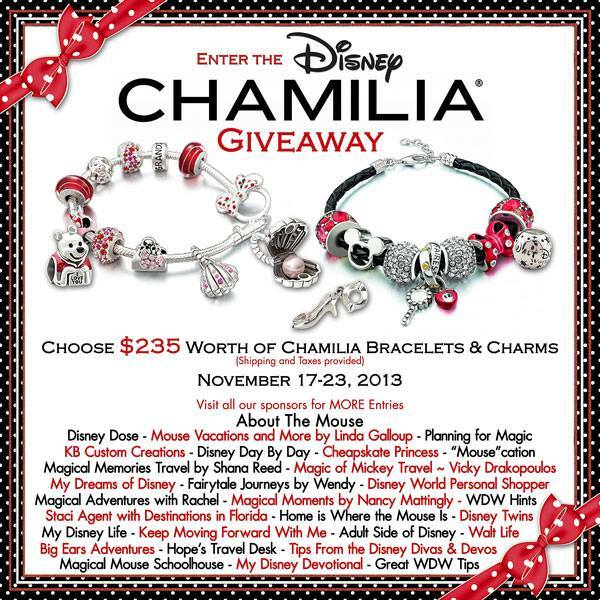 I love Disney Chamilia charms – these would be awesome on my Chamilia bracelet? I hope I win!! !